Manuel Antonio has been called the most beautiful beach in Costa Rica and Carara offers easy access trails and walking paths to accommodate every visitor. Carara National Park is well known for birding and visual plant diversity, while Manuel Antonio National Park will almost always offer the opportunity to see exciting wildlife in its natural habitat. 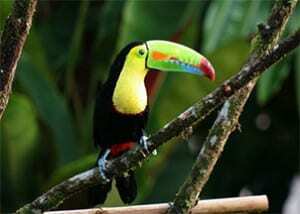 Carara National Park began as a biological reserve in the late 70’s and was upgraded to National Park status In 1998. The park encompasses 52 square kilometers which includes parts of the Tarcoles River Basin and is easily accessible to visitors of all ages and abilities. Located about 15km to the north of Casa Ponte, visiting Carara is an easy half day outing. Because this park contains a larger section of primary rainforest than Manuel Antonio National Park to the south, it is often a bit wetter with denser vegetation, making it a birding paradise. In addition to a myriad of plants and other bird species, Carara hosts the largest population of Scarlet Macaws in Costa Rica. While some mammals do reside in the park, they are often hard to spot because of the forest density. If you’re looking for an easy walk with great opportunity to see the flora and some fauna Costa Rica has to offer, then Carara is the park for you. 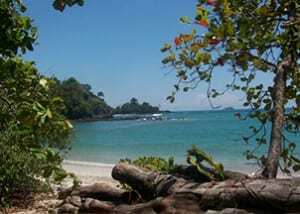 While it is one of Costa Rica’s smaller National Parks at approximately 16 square kilometers, Manuel Antonio National Park is by far one of the most popular destinations for visitors to this area. Located 75km south of Casa Ponte, a visit to this park is usually a full day outing. 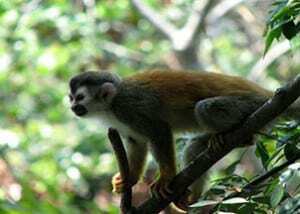 With 4 beaches, and a wild diversity of animal life, Manuel Antonio is one of the best places to spot the white-headed capuchin monkey, howler monkeys, sloths, reptiles, amphibians, as well as to explore the natural beauty of the forest and surrounding areas. The trail system within the park offers wide paths with smaller hiking trail offshoots for the more adventurous visitors to the park. Guided walks are recommended as the guide can help you spot many of the hidden animals and special plant species within the park; however, you can also experience the park on a self guided tour as all trails are well marked.